These castles are heavy cardstock, die-cut and pre-scored to make them easy to build. They're designed to fold and unfold without damage, so they're totally portable, and store in a very small space. When the game's over, just fold 'em up and go! This set continues the Cardboard Heroes tradition of great miniatures and accessories at a low price. The building in this package can be assembled either as a walled castle or as a huge, solid Keep. And you can add sets to make your fortress the envy of the surrounding kingdoms. 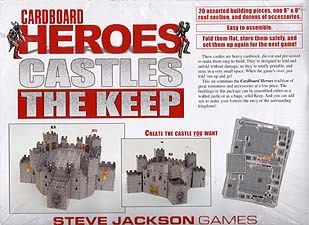 This set stands alone... but it's also designed to work with the first Cardboard Heroes Castles set, Walls and Towers. The stone design is the same. The flags and banners are different, so now you have eight different flag colours to choose from.